I love the little birds on the bags! I do love bags, but I also love mini quilts. I have done a few swaps and I love decorating the house with them! I love your bag so cute!!! I give away a lot of pillow cases as well as quilts. 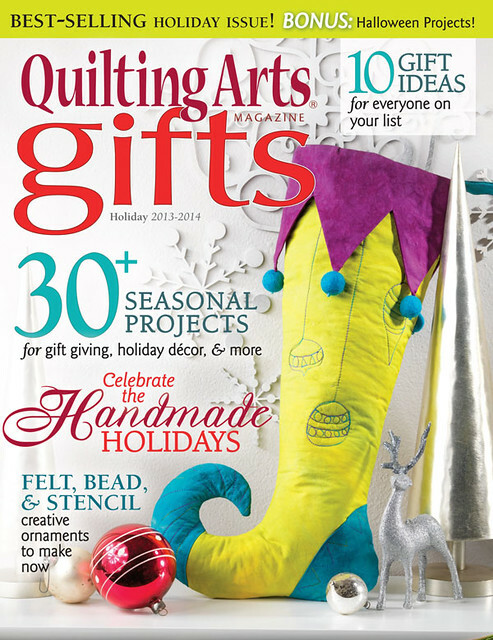 My favorite gift to give or receive would be a quilt! Ooh, I get to be first! My favorite gift to give is a quilt and a matching pair of pillowcases. I've been making a few pin cushions lately to give away. The latest one was a crocheted bowl with a pincushion top. My favorite handmade gift to give is quilts. I've never received one but I'm sure if I did it would be a favorite gift too. My favorite handmade items are minis although if someone wants to make me something handmade, I'm not picky! I love making my fanily handmade gifts - especially since I haver to post them a long way away. Tea towels and hot pads are my go-to presents! Love, love, love those bags. Candy is a great teacher, too! I love that messenger bag, too. It looks like a do-able pattern! I do Christmas ornaments for my grand kids and they love it..thank you for the giveaway...marta...martamanole@yahoo.com. My favorite items to give away are place mats. They provide a nice small space to practice piecing and free-motion quilting. It would be so fun to make some in Candy's style. Thanks for the chance to win. Anything someone makes is good by me. A friend always makes little ornaments. I love them. My favorite gift is the quilt I am making for my FIL this Christmas. 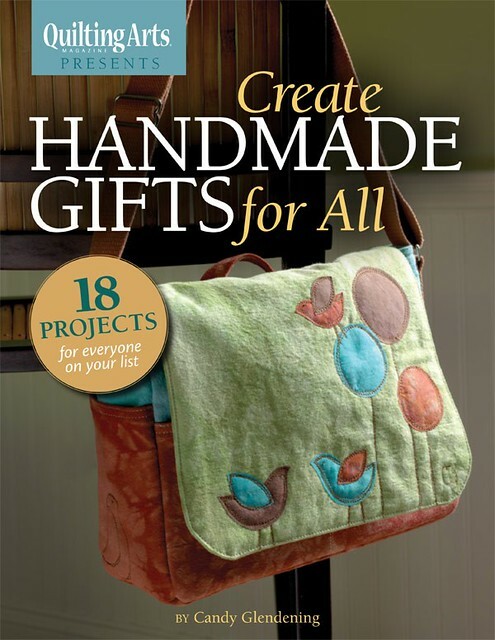 I don't have a go-to handmade project for gifting. I enjoy figuring out exactly what I can make to surprise and delight the receiver. I love to make tote bags as gifts! I love making placemats for family and friends... but for very special occasions, I make lap quilts!! Like right now I am hand quilting one for my SIL who turns 60 next month!! I like to giveaway my scarves. Love this giveaway! I absolutely love gifts of a table runner or placemats! I love receiving handmade stitched cards and enjoy making most anything. Lots of ideas in Candy's book! I think that was the book I almost bought last week. Super cute bag! I love to make bags for me and others. I love the bird bags in the book - they are just beautiful! Handmade gifts have the special something to them. As a mother of 2 boys its hard to make clothes but quilts have been loved and adored and I was chuffed when my eldest son asked me to make him his own giant bag for school. 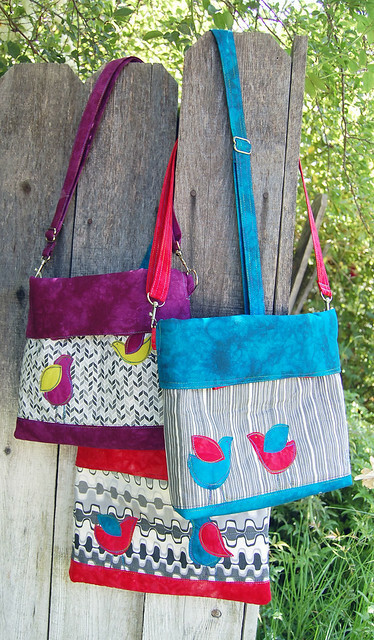 Zippered pouches are always a great gift and are quick and easy to make. I made the cutest "bapron" for a friend's baby and it's now my favorite gift for new mom's! Don't know what I'll make this year, Candy's ebook could seriously help there, but I am very touched when I receive something that someone has made for me, investing their time and effort. I have a very simple purse pattern I make that everyone loves. The first one I made 5 years ago and the recipient still uses it. It so simple to make yet I think that the fact that it allows me to show off some cool fabrics is why it's so liked. I love giving quilts for gifts, mainly wall hanging size. Thank you! My favourite gift to send is a personalized ornament. Looks like an awesome book full of pretty things. I love to give either tablerunners or zippered pouches. Both items can be made fairly quickly and it's so easy to customize your gift with fabrics. Thank you and Candy for a super giveaway and a chance to win. I like to make table toppers and zipper pouches for gifts. Love the bad - super awesome! I really like to make quilts to give. Most of the time the recipient is just thrilled! I love those little birds, they would look great on a zipper pouches for gifts. I recently gave a pillow case, a bag and a ruffle apron to my sister and her daughter. I'm inspired to get started on some Christmas gift ideas. I love giving quilts! Thanks for the chance to win! I love to make Christmas ornaments for everyone in my family - usually a Santa or a snowman. I like making bags, in fact I need a new one for Fall. My favorite handmade gift to both give and receive is a quilt - anything from a mug rug to a full size quilt. Thanks for the chance to win! I love this beautiful bag! The best gifts I ever gave, IMO, were throws made using similar colors to a comforter my grandmother had made. I had the wool recarded and made into 3 small duvets. I gave one to my parents, my sister, and--myself.